Every corner of the world has a place for Chinese cuisine. And two of the most beloved dishes among the diverse Oriental gastronomy are Szechuan and Hunan Chicken. Despite their shared country of origin, these two dishes aren’t quite the same. They differ in composition, consistency, and spiciness, distinctive of the Chinese regions that they originated from. To gain better understanding of the intrinsic characteristics of their regional categories, we should define what differentiates Szechuan and Hunan cuisines from one another. Szechuan cuisine (also spelled Szechwan or Sichuan) is a style of Chinese cooking originating in the Sichuan Province of southwestern China, a region famous for bold flavors, particularly the pungency and spiciness resulting from generous servings of garlic and chili peppers, as well as the unique flavor of the Sichuan peppercorn, an intensely fragrant, citrus-like spice that produces a “tingly-numbing” sensation in the mouth. Peanuts, sesame paste and ginger are among the most distinctive ingredients. Add to that the dynamic taste brought about by pickling, drying and salting methods. Szechuan Chicken is a member of this category. Its sauce is a chili garlic paste made with whole or ground chili. Fundamentally, it is comprised of the following ingredients: boneless, skinless chicken breasts, egg whites and cornstarch for the meat, Shao Xing rice, dry sherry or cooking wine, Worcestershire sauce, Tabasco sauce or chili paste, sesame oil, soy sauce, brown sugar, cayenne pepper, crushed red chilies, minced ginger, carrot strips, sliced red bell peppers, chopped green onions, and vegetable oil for the sauce. The dish is then cooked by frying the battered chicken, pan frying the vegetables, and mixing the sauce, stir-frying everything for a minute or two. Szechuan chicken is best served with steamed rice. The dish is very easy to cook. Taste-wise, it renders a good mix of sweet and spicy. Conversely, Hunan cuisine – also known as Xiang cuisine – originated in the Xiang River region, Dongting Lake, and Western Hunan Province. Even though it is subdivided based on the abovementioned regions, it is identified by its ‘mala’ – a hot and tongue-numbing seasoning. Much like Szechuan cuisine, it employs liberal amounts of chili peppers, garlic, and in addition, shallots. However, compared to Szechuan, Xiang is more prominent for being dry, purely hot and – most of the time – oilier. It is said that Hunan cuisine tends to be purer and simpler in taste than Szechuan cuisine. It is generally comprised of a wide range of fresh ingredients combined with smoked and cured meats. What makes it unique is the fact that its menu changes depending on the season; local ingredients are utilized to complement the season. Cold meats with chilies help locals keep cool in the summer, while hot and spicy pots are ideal for staying warm during winter. Recipes for Hunan chicken include: bite-sized chicken meat, light soy sauce, sherry, shredded ginger, chili peppers, scallions, chicken broth, wine vinegar, sugar, salt, powdered anise pepper, and cornstarch. First, the chicken is marinated in a soy sauce, sherry, and ginger mixture for about 20 minutes. Meanwhile, the rest of the liquid ingredients are mixed separately. The vegetables are then stir-fried for a couple of minutes. Afterwards, everything is mixed together and cooked on low heat until the chicken is tender. This dish is best paired with rice. Hunan chicken tends to be spicier, yet plainer in taste. 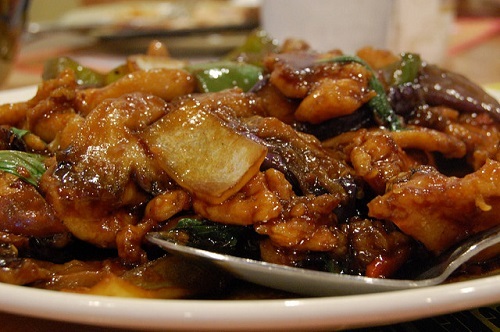 1) Szechuan and Hunan Chicken are Chinese dishes originating from two different regions. 2) Both dishes contain large amounts of of chili peppers and garlic. Hunan, however, is generally hotter in flavor than the Szechuan dish. 3) Szechuan chicken results in a good mixture of sweet and spicy, while Hunan chicken is plainer and hotter. Celine. "Difference Between Szechuan and Hunan Chicken." DifferenceBetween.net. May 9, 2017 < http://www.differencebetween.net/object/comparisons-of-food-items/difference-between-szechuan-and-hunan-chicken/ >. To identify Hunan cuisine from Sichuan cuisine, Chinese people identify the different kinds of ‘heat’ or spicyness. Sichuan cuisine is referred to as ‘mala’ meaning numbing (ma) and hot (la). Hunan cuisine is referred to as ‘ganla’ meaning dry (gan) and hot (la). Hunan cuisine is indeed more spicy than Sichuan cuisine. But Sichuan cuisine usually leaves a longer spicy and tingling sensation in your mouth than Hunan cuisine. I love this article. Thank you. Difference explained!…(and so much better than the other things I’ve read). And thanks so much to Eric for the translation comment! Thank you I found this article very helpful! When on a low carb restricted diet, what would be the best choice in Chinese food. I am aware of the overshadowing item called “rice”, but one can always eat only half if it. Would restaurants be willing to give extra vegetables instead of the rice?